Want the look of expensive tropical wallpaper without the cost and mess that can come with it? Then take a look at our Palm Fronds Wall Pattern Kit. This large stencil kit is perfect for creating an amazing tropical wall pattern. Large palm leaves are a tropical trend that are easily produced with our beautiful leaf stencils. Wall pattern kits are super easy to use: just place the stencils by eye and create your own wall pattern without the hassle of registration and perfect alignment! No making a mistake here, what a great choice for stenciling beginners! So, start the staycations with our tropical stencil patterns, and don't forget the Margaritas! Cutting Edge Stencils is delighted to introduce our new Wall Pattern Stencil Kits! 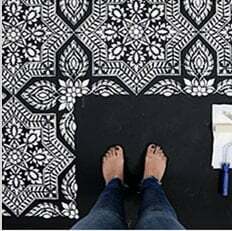 Allover stenciling just got ridiculously easy and fun. No more stress! Our Wall Pattern Stencil Kits are designed in such a way that they can be placed by eye with no measuring or alignment necessary. You will be amazed at how quickly you'll be able to cover your walls with these gorgeous tropical leaf patterns and how little paint you'll use. These stencils are a very cost effective alternative to designer wallpaper and you can say you painted it yourself! Fun, Easy and Inexpensive! Do not worry about perfect placement. Our wall pattern kits are designed in such a forgiving way that placement by eye still produces great results. Just randomly place your first stencil, make sure it's level (if needed) and let's go! Place the next stencil by eye, trying to keep a similar distance between repeats. You can use our photos as reference to help you with placement. Just step back and see where your next repeat should be. You can space the designs tightly or loosely, depending on personal preference, both ways it will look stunning. In a way, there is no making a mistake with these forgiving free-form wall stencil patterns! If you wish to preview your stencil placement, first position pieces of blue tape on the wall and adjust them until you're happy. Then, grab your roller and stencil away! It took us less than 1 hour to stencil 8x15' wall using a Wall Pattern Kit, and it was lots of fun, too! Our stencils are made out of durable 12 mil clear plastic stencil material. This material is strong but flexible, reusable and easy to clean. We love it so much more than standard 5-8 mil Mylar! It's not brittle, user friendly and just so easy to work with. In our many years of professional stenciling this material has proven to be far superior than any other stencil material we used. Our customers love it too, and we are sure that you'll notice the difference! Our stencils will last a long time and are a pleasure to use.